★Appearance -The wooden tool kit include wooden spanners,hammer toy, toy screws, rulers, etc. There are all made of the finest quality wood and are beautifully painted, and screws of different colors are made of reliable plastic. ★Features - The construction toys have different shape wooden cubes, such as square, round, rectangular while plastic screws have long and short. You can exercise kids\' cognitive ability of the graphics and the ability to construct three-dimensional space. 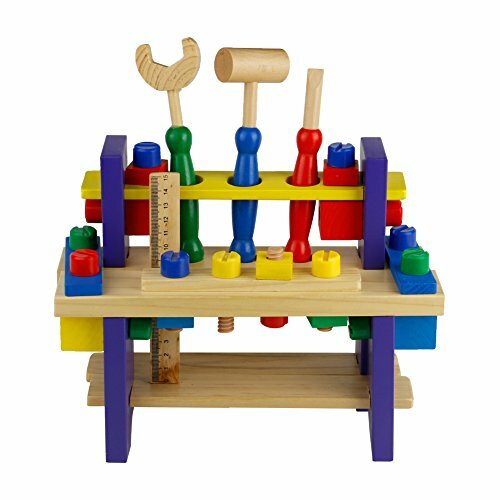 ★ Extensions - Using wooden tool kit to assemble the wooden construction set, different spatial combinations, color matching, every result is different which can stimulate children\'s ability to control, imagination and creativity. ★Entertainment - The workbench toy also is a pretend play toy which can promote kids\'social skills and have fun when play with friends. ★Educational gifts - The wooden workbench is suitable for kids over 3 years of age, as a birthday gift or Christmas gift.